Smile :). . Wallpaper and background images in the Severus Snape club tagged: smile deathly hallows part 2 behind the scenes slan rickman severus snape maggie smith minerva mcgonagall potions master proffesor harry potter. This Severus Snape photo contains chainlink fence, business suit, well dressed person, suit, pants suit, and pantsuit. There might also be street, city scene, urban setting, penal institution, penal facility, igloo, and iglu. YEAH! Gods, look at that impish twinkle in his eyes! 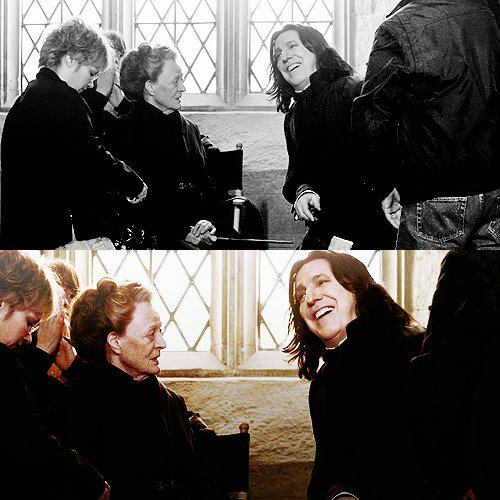 I love the way Alan can smile and laugh behind the scene, and at the same time, be most focused on his Severus character. The man is a genius. Alan mentioned in an interview that his best HP moments were behind the scenes, laughing with Maggie Smith and Michael Gambon, who have a wicked sense of humor according to him. I suspect he has nothing to be jealous of in this regard either, he has a great sense of humor himself too. Dammit... He's so lovely I can't get used to it.